(or get your money back if you already signed up) – contact us when you’re ready! 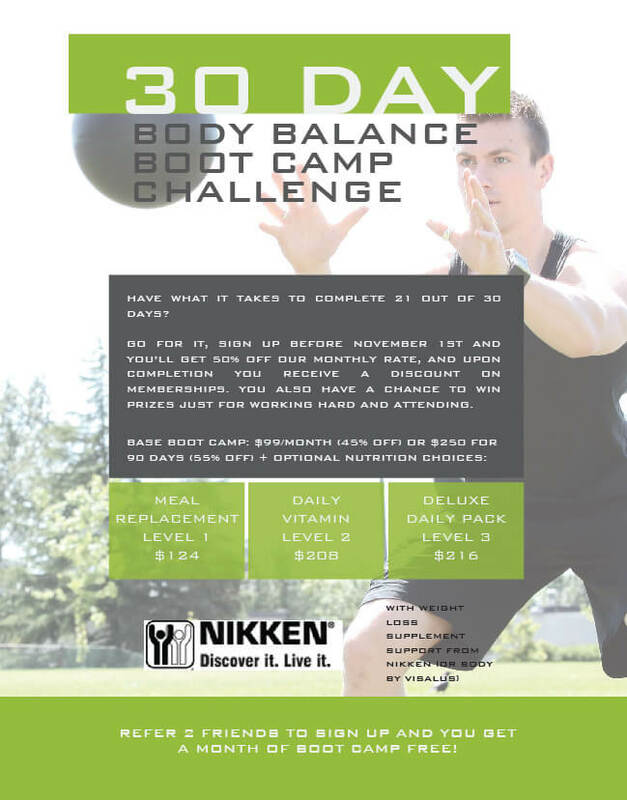 For the month of November, Kalev Fitness Solution is challenging the community to commit to 21 out of 30 days of our Downtown Vancouver Boot Camp. Proven benefits of consistent full body exercise: increased strength, improved flexibility, better sleep, stress reduction, possible weight loss, improved focus, and increased energy. Purchase a 30 Day Challenge pass for $99 before November 1st and receive unlimited Boot Camp, Cardio Kickboxing, Spin, Yoga, Core Conditioning, Tabatas, and Pilates. Challenge participants will also receive 10% off the purchase of Monthly Group Fitness or punch cards until Dec 1st! If you complete the challenge you get 10% of our 1 year and 6 month memberships! Space is limited, so sign up online or with a member of our team today. We’ve created a monthly progress chart to help you record your progress. Keep this somewhere you’ll see it on a daily basis as a constant reminder of your intentions and accomplishments. With the support of your friends behind you, we are her to help guide you to your goals! Plan your Vancouver Boot Camp schedule a week ahead of time, and make sure you schedle your prefered time the day before to reserve your spot in class online. Try a variety of class types and trainers! Reward yourself for accomplishments – plan a night out at the end of you challenge with you challenge team mates. Set goals and intentions for your challenge and track your progress. Plan to come woth friends or family so you stay on track. Don’t get discouraged if you miss a few classes. Try to make them up by doubling up (Boot Camp then Yoga) or just go as often as you can.